The definition of the cutting modes for the current operation can be performed in the <Operation parameters> window on the <Feedrate> page. The window opens by pressing the <Parameters> button. 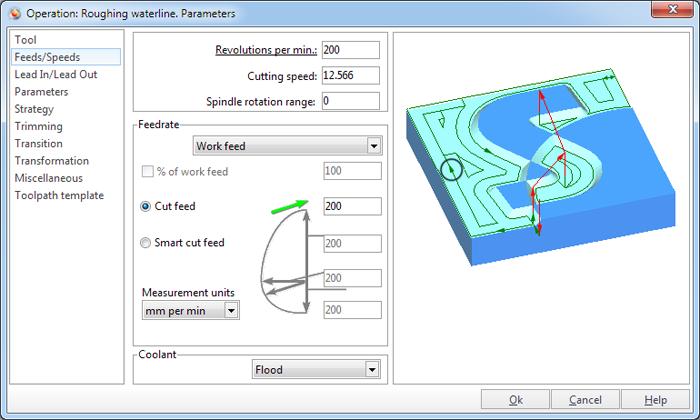 Using this dialogue the user can define the spindle rotation speed; the rapid feed value and the feed values for different areas of the toolpath. Spindle rotation speed can be defined as either the rotations per minute or the cutting speed. The defining value will be underlined. The second value will be recalculated relative to the defining value, with regard to the tool diameter. <Cutting speed>. Defines the spindle rotation speed in meters or feet per minute, depending on the selected measurement units. The parameter will be recalculated if the rotation speed or the diameter of the tool is altered. <Spindle rotation range>. Defines the range of the spindle rotation. Use this parameter only for the old machines, that have the spindle speed range switcher. The user can also define the feedrates for various areas of the toolpath. The number of feed type options in the drop down menu will vary depending on the current operation type. Different operation types will have different options available. <Rapid feed> is mainly used for transitions at the safe plane. Toolpath sections, performed at rapid feed are displayed in red. When switched to rapid feed, the system creates the RAPID command in the CLDATA program. For most CNC controls, the value of the rapid feed is not used in the NC program, but this value is always used by the system to calculate the machining time. <Work feed> defines the feed at which the work feed will be performed. This is the main feed value. All other feed can be defined as a percentage of this value. <Approach feed> defines the feed at which the approach move of a tool. By default, the approach feed is equal to 50% of the work feed. <Retract feed> defines the feed at which the retraction from the object being machined. By default, the feed is equal to the work feed. <Plunge feed> defines the feed at which the system performs a vertical (Z) plunge to the next machining level. By default, it is equal to 50% of the work feed. <Feed to next> defines the feed that is applied when the tool moves to the next toolpath. By default, it is equal to 50% of the work feed. <Retrace feed> defines the feed that is used if the tool moves over an already machined area. By default, it is equal to 300% of the work feed. <First pass feed> defines the feed that is used for the initial cut of the tool in the workpiece. By default, it is equal to 50% of the work feed. <Finish pass feed> for roughing operations this defines the feed used when cutting along a surface. By default, it is equal to 50% of the work feed. <Measurement units>. A feed can be assigned either in millimeters per minute, in millimeters per revolution of the spindle or in millimeter per tooth. if mm/tooth is set then Feed is calculated with using of the current RPM and teeth number. Teeth number is set on the "tool" page. <Coolant>. If coolant is enabled then the appropriate command will be added to the NC program to control the switching on/off of the coolant. If the <Cut feed> option is selected, then the feed value can be defined in the appropriate field. Using this option means that the feed does not depend on the tool movement direction. If the <Smart cut feed> option is selected, then the feed will be calculated for every move by taking into consideration the parameters entered by the user for the work feed direction (feed when moving vertically up, horizontally, vertically down) and the angle between the movement direction and the vertical. It is possible to define feedrates as a percentage of the work feed by ticking in the <% of work feed> box. When selected, the feed type (<Cut feed> / <Smart cut feed>) and <Measurement units> will be set as they were for the work feed, and all other feed values will be calculated as a percentage of the work feed value.